This past week the Museum had the pleasure to head down to the North Vancouver home of Rolf and Lotti Frowein to discuss the history of the Tyrol Ski & Mountain Club with the Froweins and fellow Tyrolians Jim Brown and Walter and John Preissl. The Tyrol Ski & Mountain Club was formed in 1952 by a small group of Vancouver skiing and hiking enthusiasts, most of whom were recent immigrants from German-speaking Europe. From the start, the Tyrol Club’s main purpose was to encourage people to get outside and take advantage of the beautiful mountains surrounding Vancouver. Many were North Shore ski instructors, and they were big promoters of the sport during the post-WW2 boom days of skiing. 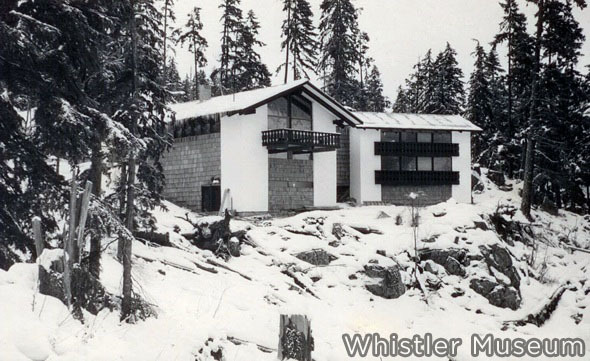 Even though the Tyrol club’s membership has always been centered in Vancouver their Whistler roots run deep, and the club and its members have played a surprisingly important role in Whistler’s rise as a ski resort. 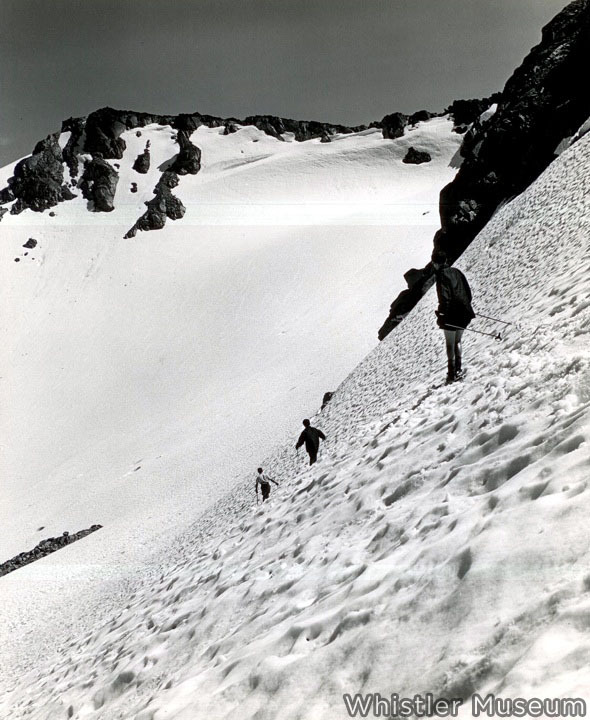 Rolf Frowein, along with a group of Tyrolians, first came up to Alta Lake in 1959 and instantly began exploring the surrounding mountains, winter and summer. Walter Preissl, Al Preissl and Erwin Kasiol ski down towards Glacier Bowl on Whistler Mountain, early 1960s. The days of skiing in shorts will soon be upon us again, too! Photo: Frank Grundig. A few years later the club bought some land near Nita Lake and by 1966 construction was complete on Tyrol Lodge, which stands on that spot to this day. A recently completed Tyrol Lodge, winter 1967. Photo: Frank Grundig. That first winter after building the lodge the Tyrol Club decided to move their annual ski race, the Tyrol GS, from Seymour to Whistler. 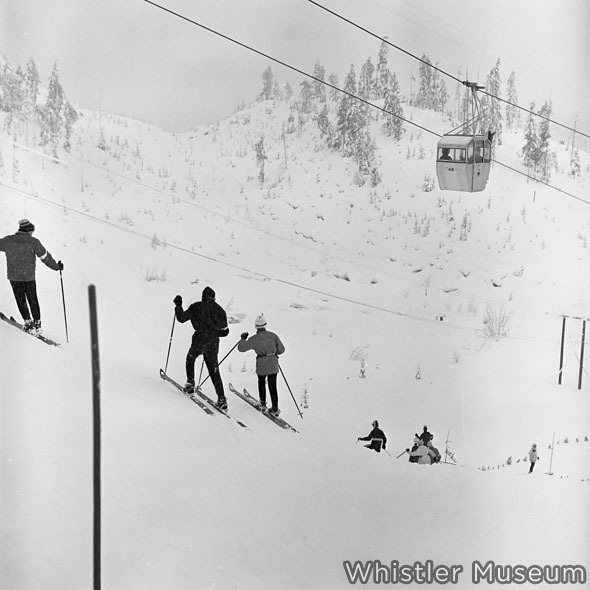 It was the first organized ski race ever held on Whistler Mountain. 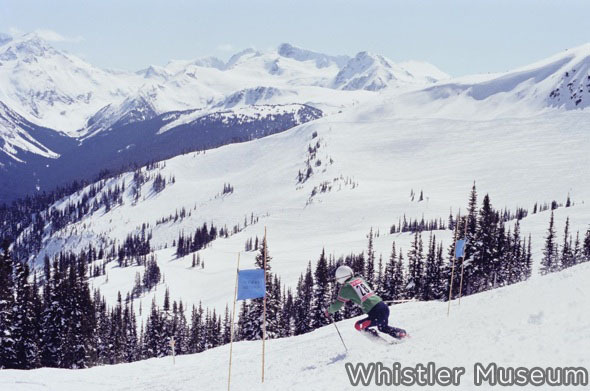 The race became a Whistler institution, running every winter until 1995. Onlookers watch an early Tyrol GS race on Whistler Mountain, late 1960s. Photo: Frank Grundig. Countless “ski-racer brats,”(to use John Preissl’s term) came up through the Tyrol Club’s racing league. Here is John’s brother Andy competing on Whistler Mountain in the late 1970s. Photo: Frank Grundig. In addition to taking the time to talk to us about the Tyrol Club’s history, the Preissl’s have generously donated an impressive collection of documents relating to the Tyrol Club and skiing history generally, and hundreds of photos from their personal collection. Most of these were taken by their family friend Frank Grundig, a professional photographer and ski journalist, so the images are of consistently high quality. 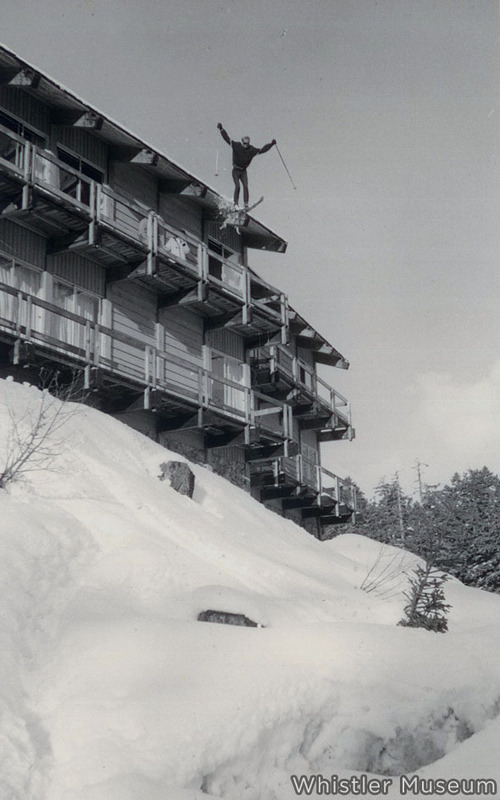 Norwegian hot-shot Dag Aabye jumping off the roof of the Cheakamus Inn, 1967. Photo: Walt Preissl. 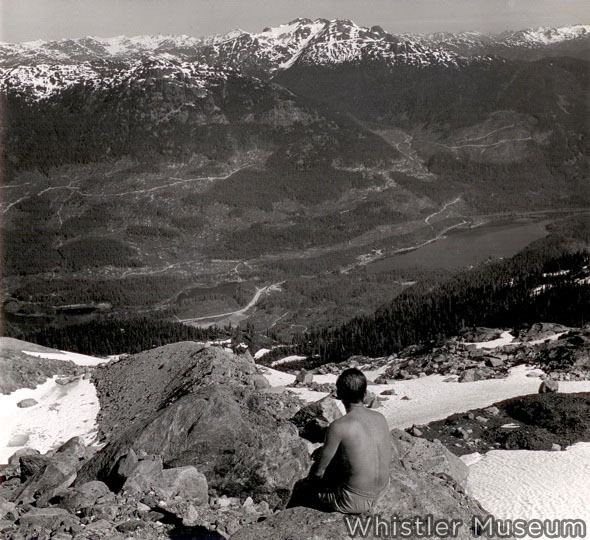 When club member’s like John Planinsic (pictured here) hiked up Whistler Mountain in the early 1960s, they looked down upon a very different valley than today. Photo: Frank Grundig. 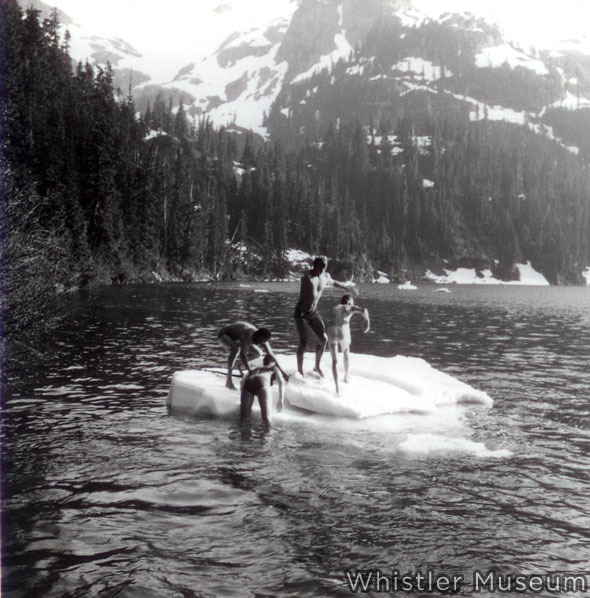 Tyrol Club members conquer an “iceberg” in Lake Lovely Water, in the Tantalus Range. Mid-1970s. Photo: Frank Grundig. Their large collection of photos leaves one with the impression that the more the valley has changed, the more the people stay the same! We’ve only acquired a small portion of the photos so far, but already we’ve got some great shots that will help us to tell the history of our local mountains in greater detail, both inside and beyond the ski resort. Look forward to more stories from the Tyrol Club collection in the weeks and months to come. Coincidentally, this evening the Tyrol Club celebrates their 60th anniversary in Richmond. We are excited to be partnering with such a great group of people, and we feel a congratulations are in order! This entry was posted in Recreation, Skiing, Whistler Blackcomb and tagged Pioneers, Recreation, Skiing, Tyrol Club, Tyrol Ski & Mountain Club, Whistory. Bookmark the permalink.